The first page of John in Codex Y. In 1901, twenty years had passed since the publication of Westcott and Hort’s groundbreaking compilation of the Greek New Testament. The Textus Receptus and its primarily Byzantine readings had, for the most part, been pushed aside. The compilation that stood in its place, and which formed the basis for the American Standard Version which was released in 1901, was essentially Alexandrian. 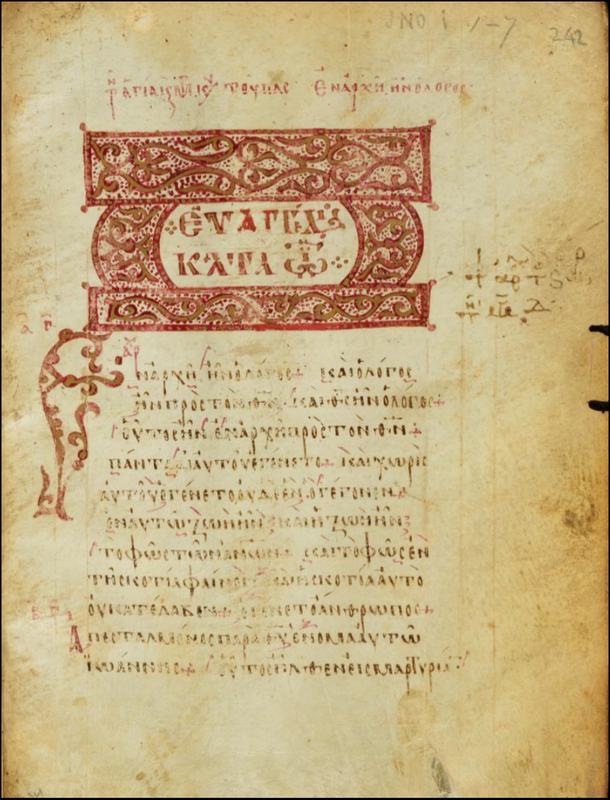 Also in 1901, Codex Macedonianus was discovered – an important manuscript of the Gospels, also known as Codex Y or 034 – but hardly anyone seemed to notice. Before the release of Codex Y, the Sinaitic Syriac and its numerous rare (but wrong) readings captured the imagination of scholars, and a few years after the existence of Codex Y was announced, Charles Freer obtained Codex Washingtoniensis, which is still famous for the interpolation between Mark 16:14 and 16:15 that bears the name of the manuscript’s purchaser, the Freer Logion. In between the discoveries of those two manuscripts, it is not surprising that the discovery of Codex Y by J. Bevan Braithwaite, and its subsequent analysis by his brother, W. C. Braitwaite, did not capture the spotlight. Codex Y is younger (its production-date is assigned to the 800’s) and its text is mainly Byzantine, which, in the early 1900’s, was understood by leading textual critics to mean that it was far less important than Alexandrian and Western texts. Even though Bruce Metzger drew attention to Codex Y in 1963, stating that it deserved more attention than it had received up to that time, not much attention seems to have been given to it. More recently, however, the stewards of Codex Y at Cambridge University have digitized the entire manuscript, indexed its entire text, and produced a detailed description of its physical features. So this might be a good time to become acquainted with this impressive Gospels-manuscript. Codex Y measures approximately 18 centimeters tall and 13 centimeters wide. Its uncial letters are neatly written. Chapter-titles in large red uncial lettering appear at the top of the page on which chapters begins. The text is divided into Eusebian sections, and the section-numbers are written in red (except in Luke 1:1-11:26) in the margins (365 for Matthew, 233 for Mark, 342 for Luke, and 232 for John). Sections frequently begin with a red initial that protrudes into the left margin; where such an initial does not appear at the beginning of a section, an obelus (two dots, arranged like a colon, and separated by a small wavy horizontal line) appears in the text at the start of the section, and another obelus accompanies the section-number in the margin. When the manuscript was in pristine condition, each Gospel (as far as can be discerned) was preceded by a brief introduction and a chapter-list. In addition, artistically executed headpieces for Mark, Luke, and John are extant. Codex Y possesses an interesting lectionary-apparatus. Symbols for arche (start) and telos (stop) are written in red in the text; blank space was left so that they could be inserted without harming the aesthetics of the pages. Lectionary-related notes and incipits (that is, the opening phrases with which the lector was to begin reading the assigned passage for the day) frequently appear at the foot of the page. 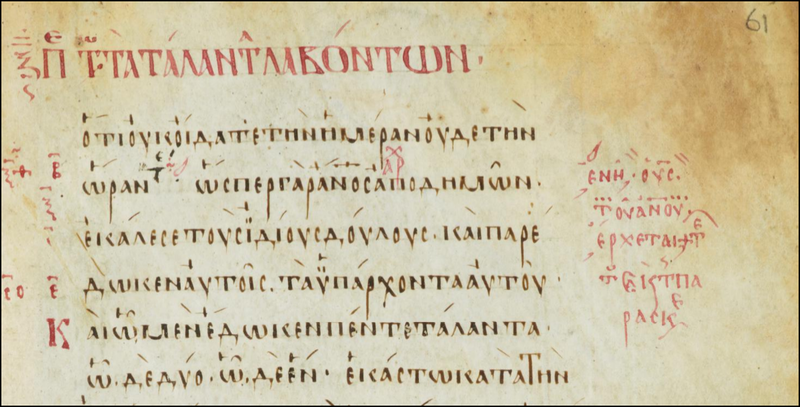 The copyist of Codex Y was relatively accurate; a few small omissions (at Matthew 24:6, Luke 2:25, Luke 10:38, Luke 11:7, and at John 6:43) are corrected in the margins, and each is accompanied by an asterisk; an asterisk also appears in the text where the omission occurred. Margin-notes also supplement Matthew 22:14, Mark 15:28, and the last part of John 8:14 – although whether the initial non-inclusion of these passages was the fault of the copyist, or a reflection of his exemplar, may be an open question. The phrase καὶ οἱ μαθηταὶ αὐτοῦ is also missing from the end of Matthew 9:19 – a parableptic error that went undetected by the proofreader. "in which the Son of Man comes"
of the text) by comet-like symbols. The text of Codex Y is written in one column per page, and the number of lines on each page is strangely inconsistent: at first, there are 16 lines per page; then the last page of the Gospel of Matthew has 17 lines (very probably so that the following page would not be occupied by a single line of text); the number of lines per page then returns to 16 when Mark’s text begins, until Mark 3:13, at which point the number of lines per page jumps to 19, and stays there until Mark 16:20. The text of the Gospel of Luke is written with 16 lines per page, at first, but suddenly changes to 21 lines per page in chapter 11, and then back to 19 lines per page in chapter 13. These shifts may indicate that the copyist worked on each Gospel (or two sections of a Gospel in the case of Luke) separately, using different batches of differently prepared parchment. Some pages are missing: all of the pages that contained Matthew 1:1-9:11 and Matthew 10:35-11:4, Luke 1:26-36, Luke 15:25-16:5, Luke 23:22-34, and John 20:37-21:17.
the existence of the PA in an earlier copy. ● Mt. 16:2-3 – Y does not include most of the passage, agreeing with the Alexandrian Text. ● Mt. 22:14 – Y does not include this verse; it is added in the margin. ● Mt. 24:18 – Y has το ιματιον (garment) rather than τὰ ιμάτια (garments). ● Mt. 24:36 – Y does not have μου. ● Mt. 25:13 – Y does not have the final phrase “in which the Son of Man comes.” The phrase has been added in the margin, apparently by the rubricator (in red ink). ● Mk. 4:30 – Y reads υπο την λυχνιαν επιτεθη, which, with υπο instead of επι, means, “set in place under the lampstand,” rather than “set in place upon the lampstand.” It is tempting to suppose that some copyist pictured lampstands as something like simple chandeliers underneath which lamps were suspended. ● Mk. 10:20-21 – Y adds τι ετι ὑστερω (“What am I missing?”) at the end of the man’s question, and adds ει θελης τέλειος ειναι (“If you want to be perfect”) at the beginning of Jesus’ answer. Both harmonizations are supported by Codices K, M, N, W (which transposes the first part), and Π. ● Luke 14:5 – Y reads ονος (“donkey”), not υιος (“son”). Codex Y thus adds to the array of witnesses which favor this reading, which is neither Alexandrian nor Byzantine (both support υιος, and so do P45 and P75) but which was adopted in the Textus Receptus, and has strong intrinsic appeal (as well as a diverse array of external support which includes ﬡ, K, L, Ψ, 33, family-1, the Palestinian Aramaic version, various Old Latin copies, and the Vulgate). ● Luke 18:24 – Y reads των ουρανων (“of heaven”) instead of του Θεου (“of God”). Again Y finds allies in Codices K, M, and Π. The staff of the Cambridge Digital Library (which includes in its diverse collection Codex Bezae and a first-edition Gutenberg Bible) is to be congratulated for its high-quality presentation of this manuscript. Not only are the photographs first-rate, but so is their magnification-method. Visitors will learn much from an exploration of the “About,” “Contents,” Item Metadata” and other sub-sections of the site. 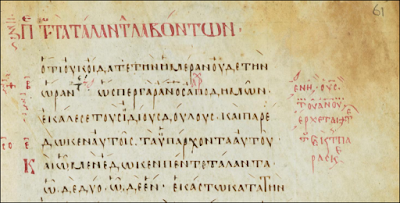 Codex Sinaiticus may still have the most thorough online presentation of any Greek New Testament manuscript (though the flaws in its on-site “translation” have not been addressed), but the presentation of Codex Macedonianus is not far behind. So this manuscript DOES NOT contain the pericope adulterae, yet you are unable to just say so. Does anybody believe that knowledge of this pericope did not exist during this timeframe, of course not! The comment by Braithwaite in his ET article are interesting, but carry little weight in reality. Once again, your reasoned electism is shown to be neither. On the contrary, Mr Snapp was quite clear that (a) this MS does not contain the PA; and (b) that it has rubrical markings that indicate its exemplar or a predecessor exemplar apparently had the PA present. Why is there a problem? This is very interesting. We are always hearing about marginal notations--asterisks even--that cast doubt (NOT!) on the authenticity of an included passage. But here we have marginal notations used to cast doubt on the authenticity of *omitting* a passage. At the very least we should be hearing about both uses.